SmartVacations is a four-day program that meets April 16-19, 2019. Choose classes to fill your vacation week with fun and enriching activities. Your schedule options are below. Please call us: 617-730-2700, ext 0 with any questions. 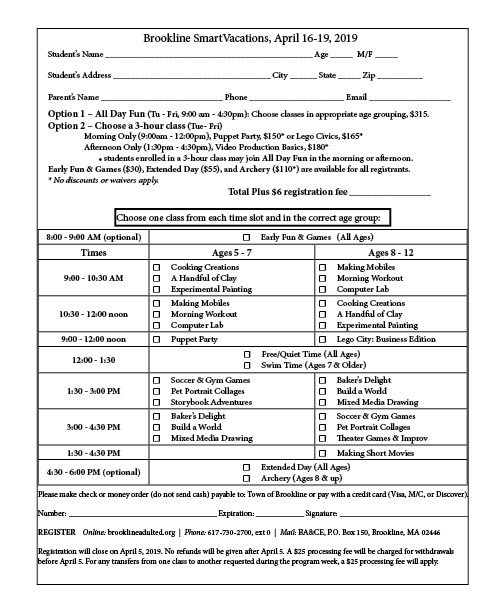 Select one class from each time slot and in the correct age group (see the schedule), $315. Note: Early Fun & Games $30, Extended Day $55, and Archery $108* are available for all registrants. *Please note: Discounts or waivers do not apply to these classes. Online Registration has closed for April Vacation, but you can still register by phone until Wednesday, 4/10. Call us at 617-730-2700, ext 0.